These notes were produced for use with students aged 14-19 in 2004. This is a long entry (over 6,000 words) and offers ideas about the film covering Key Concepts in Film and Media Studies. All of the links have been checked to ensure that this is a useful resource for working on an important Australian film. In the 1930s in Western Australia the state government has a policy of removing mixed race girls from aboriginal communities and educating them separately, hoping to control the extent of racial mixing in future generations. Three young girls are taken from their mothers and placed in a camp a thousand miles away. They escape and attempt to make the journey home – on foot. Rabbit-Proof Fence is a useful film text to study for the following reasons. As a narrative, the film appears to be very simple in terms of structure. Three girls are taken to a settlement over 1,000 miles away. They escape and attempt to walk home across very difficult terrain. There are relatively few of the dramatic incidents that might be expected in a mainstream narrative – how does the film retain audience attention? In terms of representation as a key concept, the film details the attempts to eradicate a sense of cultural identity in Australian aboriginal communities – and offers a representation of Anglo-Australian identity in the 1930s. A distinct aesthetic is used in terms of image and sound in order to convey the importance of environment in the narrative. In industrial terms, the film represents the ‘return’ of an Australian ‘auteur’ filmmaker after several years away making mainstream Hollywood films. In terms of audiences, the film has been particularly successful as a ‘specialised film’ or ‘art film’ with audiences in the UK. The film is part of a wider cultural transformation in Australia in which ‘hidden’ or ‘invisible’ histories of the treatment of Aboriginals have recently emerged. The screenplay was developed by a documentary filmmaker, Christine Olsen, who based the work on a book published in 1996 by Doris Pilkington, the daughter of the real Molly Craig. The process of casting the young actors and preparing them for the shoot is presented on the DVD copy of the film. Ironically, in working closely with young Aboriginal actors outside their home environment, director Philip Noyce was perhaps echoing some of the actions of the authorities in the film. 2. The Chief Prosecutor – Neville’s office in Perth. 3. Stolen – the girls are captured in Jigalong. 4. Slide show – Neville gives a lecture in Perth. 5. Moore River – the girls’ reception and the meeting with Neville. 6. The Escape – Molly leads the other girls. 7. Tracker – Moodoo is sent after the girls. 8. River chase – Molly uses the river to ‘cover her tracks’. 9. Farmhouse – the girls get food. 10. Ambush – Neville plans to catch the girls by the fence. 11. Mavis – a maid in a farmhouse helps the girls. 12. Lost tracks – again the girls evade the tracker. 13. Gracie’s recapture – Gracie goes to the railway station. 15. Coming Home – Constable Riggs is frightened away by Mother and Grandmother and the girls rejoin their family. Each of these chapters is about 5-6 minutes long – about the right length to study in detail. All the chapters give us information about the characters and the story, but some are important for specific reasons. The Prologue and the Epilogue are at either end of the story and they tell us what has happened before the main story begins and then what happens after the main story ends. The use of this literary or theatrical device perhaps indicates the historical importance of the story – it creates for the audience a sense that it is important to locate the story in Australian social history and to consider its implications in a contemporary Australian context. when Gracie decides to go to the station and Molly decides to keep going. Sometimes there are moments in the story when it is easy to miss the importance of a small action. For instance, the tracker Moodoo is very experienced and very skilled, but he seems to be fooled by a teenage girl. Is he really unable to track the girls or is he consciously trying to help them escape? We see him several times during the chase – what kinds of clues do we get about his behaviour? Remember, he has a daughter in Moore River and he is being employed against his will. A narrative analysis of the film is likely to consider the beginning or the end of the story (when several questions from the beginning are usually answered) or any one of the turning points. Such an analysis will need to consider camerawork, mise en scène, music etc. as well as the sequence of events and the dialogue between characters. Here is the beginnings of an analysis of the scene (Chapter 4 on the DVD) where Mr Neville explains his ideas to a group of women in Perth. This scene is important not because it ‘moves the story forward’, but because it gives the audience important information that will help us to understand Neville and his actions. The sequence begins in Chapter 4, immediately after the children have been taken and we have the distressing shot of the Grandmother beating a rock against her head. By ‘cutting’ to Neville’s lecture at this point, the director is linking together the Grandmother’s despair and emotional behaviour with Neville’s seemingly ‘educated and rational’ explanation of his policy. In much of the scene, the camera looks up at Neville giving him authority. He literally walks into the light and speaks very clearly in a measured tone. His ideas, which in 2004 we now find repellent, are ‘out in the open’ and official policy – they do not lurk behind closed doors. The impact of the speech is all the greater because the actor, Kenneth Branagh, is a famous Shakespearian actor of great reputation and status. The lecture is presented as ‘scientific’, using technology and official photographs. The audience is a group of middle class women. They sit in their hats and best clothes, sipping tea. It is a decorous and respectful audience for Neville’s ideas. The setting also suggests the ‘normality’ of Neville’s approach. Why is the audience all women? Two possible reasons are (i) the assumption that women will most clearly understand the issues related to children and family and the threat to society of a large mixed race community, and (ii) that middle-class women in the 1930s are most likely to be associated with the charities for education and welfare that Neville needs to support settlements like Moore River. The language that Neville uses is important, with its discussion of ‘quadroons’ and ‘octoroons’ etc. During the lecture he puts himself ‘in the picture’ when he uses the pointer to trace the family development through the generations on screen. Neville is completely implicated in this venture of ‘breeding out’ the Aboriginal blood in the children, but he presents this as noble work which is designed to help the Aboriginal peoples. With a scene like this, it is worth considering how else the filmmakers could have given us the same information – perhaps in a straight discussion between Neville and one other person, perhaps a series of short scenes in which we see the work of his department. The choice of the lecture format is important. Several commentators have pointed out that in 1931, similar ideas about ‘racial purity’ were being shouted out by the Nazi Party in Germany and across the world the idea of ‘breeding’ ‘better babies’ was being discussed. This was the now discredited science of eugenics – which some people fear is coming back with genetic engineering. The filmmakers in Rabbit-Proof Fence are careful not to make links with the Nazis and their actions towards Jewish people in Germany. This short scene lasts only two minutes but it has an impact. Notice how when the scene ends with Neville saying “. . . in spite of himself, the native must be helped”, the next shot is a close-up of Molly in the train taking the girls to Moore River. The arrival of the girls at Moore River starts a sequence in the film that helps to construct the conflict over cultural identity that gives the film its narrative drive. At this point, the filmmakers must show the ways in which Neville and his staff attempt to suppress the sense of Aboriginal identity and replace it with that of ‘white Australia’. What is most interesting here is the way in which ‘filmic codes’ (e.g. of camera, editing and music) are utilised. The timing of the girls’ arrival means that it is night in Moore River. In a ‘functional’ or ‘realist’ sense this means that the children will feel more bewildered because they are sleepy and confused and also because the darkness means that they cannot see much detail of the place to which they have been brought. This narrative information helps us to understand how the children feel. But it is the ‘expressionism’ of the camerawork that gives us a sense of foreboding about what is to happen. The scene opens in very long shot but then cuts to a closer shot/reverse shot of the girls being studied by the matron/sister through the gaps in the sides of the truck. As the girls get off the truck we are offered various ‘subjective shots’ – i.e. shots in which the camera mimics the viewpoint of the children. The camera tracks with the children as they move towards the dormitory hut, following the matron shown in a low angle shot (i.e. as the small child looking up). When the door opens the camera ‘swings’/’pans’ as the children look round in the darkened room, lit only by the bobbing lamp carried by the matron. The rows of girls sleeping in cots must be highly disturbing for the three newcomers. The style of this opening is reminiscent of horror films, especially those involving children, and also of expressionist dramas of the 1940s such as David Lean’s adaptation of Great Expectations, which begins with a small boy in a cemetery frightened by the looming figure of the convict. We might expect in a horror film to have unsettling music as an accompaniment to such camerawork. Such music is present in Rabbit-Proof Fence, but it is very carefully mixed and combined with other sounds so that although it does work to disturb, it is not as noticeable or ‘obvious’ as in a genre horror film (i.e. a film which is primarily concerned with shocks/frights). The music in this scene is mainly a sequence of synthesised sounds, stretched out chords, mostly ascending but not reaching a climax. There is no tune or melody but there is a resemblance to choral sounds – like a choir of ‘ancestral voices’. There are also some ‘thuds’ and electronic vibrations or ‘washes’ of sound – again possibly representative of Aboriginal instruments such as a didgeridoo. These electronic sounds are mixed in such a way that they do not dominate the ‘realist’ sound effects of the truck, the children’s footsteps, the key in the lock etc. We also quite clearly hear the ‘comforting’ words of the matron. In the sequence, the matron is an ironic figure – dressed in white and with a lamp to light the way, she is in one sense a symbol of ‘purity’ and ‘goodness’. But the other signs point to her duplicity. This is perhaps the most disturbing aspect of these scenes. The matron is just one of the characters who are ‘doing their jobs’, believing that what they are doing is ‘right and proper’. music, dance etc. – the way we express our emotions. Notice how each of these is addressed in the other scenes that follow in this sequence. In the morning, the three girls are reluctant to leave the hut. The settlement is first shown in long shot, low angle with a slight distortion. We then cut sharply to the girls in bed together, clutching each other tightly. When they are finally cajoled into breakfast, everything is wrong. They don’t know the rules about standing for grace and the filmmakers exploit this visually. They are the only ones who sit when all the other girls are standing. The food is unfamiliar and they don’t want to eat. They might take comfort in talking to each other, but are told to speak only English. The control over language is a classic strategy for ‘colonisers’ (i.e. white Australians) who seek to erase the identity of colonised peoples. Notice that the first person in authority to tell them to speak English is the Aboriginal overseer – by persuading this man to act in this way, the colonisers achieve a double success. He is humiliated by betraying his own people (although he may belong to a different Aboriginal cultural group) and the girls are cowed by someone they feel they should respect. This is followed up by the matron who tells them not to use ‘jabber’. This is another way to denigrate local culture – the word ‘jabber’ is an English word that means ‘garbled speech’. It comes from the sound of very fast speech. To say that someone who speaks another language is ‘jabbering’ is insulting because it doesn’t recognise the way in which the other language works and effectively sees the other language as meaningless and worthless. Along with the new food and new speech comes washing and new clothes – symbolically ‘cleansing’ the girls of their outward display of ‘difference’. Now they will look like all the other girls – stripped of their original identity. It is worth noting at this point that by putting the girls into the settlement, the Western Australian authorities are acting like many similar colonising powers before them. In Hollywood films, audiences became used to both the treatment of Native Americans, ‘herded’ into reservations and African-Americans shown in slave quarters in historical narratives. ‘Mr Neville’ (Kenneth Branagh) inspects Molly (Everlyn Sampi) to see if she is ‘fair’ enough for adoption. There are two further incidents in this sequence which refer to the process of ‘transforming identity’. The first is the ‘inspection’ by Mr Neville. His objective is to find the girls who are ‘fair’ enough to be assimilated into white society – who will marry whites and have children for white Australia. Nina, the dormitory ‘monitor’ tells Molly that the ‘fair ones’ are “cleverer than us”. She has already been brainwashed but Molly is still resistant. When her name is read out, she doesn’t move. In a very clever juxtaposition, this scene opens with the children singing ‘Swanee River’, which Nina says is “Mr Devil’s favourite song”. What is important here is that the song is a very well-known example of a ‘minstrel song’. ‘Minstrelsy’ developed in the American South in the early 19th century. White men dressed as African-Americans, ‘blacking up’ their faces and performing in caricature of slaves on a plantation – as if entertaining the slave owners. These performers created stereotypes such as the lazy, childlike slave of low intelligence but great comic potential and the large ‘Mammy’ character. Minstrel shows were immensely popular and after the Civil War, black Americans started to play the roles themselves. Eventually the minstrel stereotypes appeared in Hollywood films and on radio and later television. They were popular too in Britain and the ‘Black and White Minstrel Show’ (white singers ‘blacking up’) was the centre of BBC’s early evening Saturday ‘family schedule’ until the 1970s when the impact of the Civil Rights movement in the United States finally stopped these racist representations. (The issue of ‘minstrelsy’ is at the centre of African-American director Spike Lee’s biting satire Bamboozled (US 2000).) Again we should emphasise that Neville is represented as a man who believes he is ‘doing good’. In 1931, a song which happily celebrates a yearning to return to ‘the old plantation’ was accepted without a second thought, but watching these scenes in 2004, the inference is clear. The final scenes in the Moore River sequence feature Olive, the girl who has run away to be with her boyfriend. She is found and returned by the tracker, Moodoo, who will later become crucial to the narrative. Her punishment is to be locked in the shed, beaten and then to have her long hair cut off. Again this is a cruel and degrading punishment for a young woman. ‘Solitary confinement’ in a small enclosed space is a classic method of punishing prisoners. We have seen it many times in crime films and it currently appears in a Stella Artois beer advert played for laughs in cinemas. The heat and the loneliness are designed to ‘break the will’ of the prisoner. It is combined with the hair cutting to produce further humiliation. The man in charge suggests that with short hair, Olive will be less attractive to boys. For a young woman with few possessions, her long hair is a valuable asset. In many societies, for a woman to lose her hair is to be shamed. For example, in France after the Second World War, women who had ‘collaborated’ or ‘fraternised’ with German soldiers had their heads shaved so that their shame would visible to everyone in their neighbourhood. In the settlement, Olive will suffer a similar kind of shame. All of these events (and the experience of the ‘motherless babies’ in Moore River) together convince Molly that she must escape. The Moore River sequence is distinctive in the way in which camera, sound and editing combine to portray the bewilderment of the girls and the process of transforming their identity. Once they escape, the narrative moves forward to emphasise the long journey with the threat of discovery. Inevitably, we are now expecting shots of the desert and the big skies – especially as the escape is pre-figured by Molly’s memory of being with her mother when the bird of prey (a ‘wedge-tailed eagle’) is identified as a watching spirit which will take care of the girls. The long shots of landscapes are well captured in the widescreen format. The film is shot in a ratio (width to height) of 2.35:1. This is known in the film industry as ‘Scope, a reference to CinemaScope, the first universally recognised widescreen format which appeared in 1953 as part of Hollywood’s response to television. Scope is very distinctive because it is so ‘long and thin’ – one film director in the 1950s thought it suitable only for ‘snakes and funerals’. If you watch films on television, they rarely show the correct format, instead ‘panning and scanning’ across the image or simply chopping off the sides to fit it into the television screen shape. If you are able to go to the cinema or watch the DVD you can see the full frame. The other factors in these landscape shots are colour, camera movement, ‘effects’ and music. The cinematographer Chris Doyle is particularly well-known for his use of colour and visual effects, but mostly for his presentation of urban environments. Here he is quite restrained until the final part of the journey, including the sequence in which the girls collapse in the desert (Chapter 14 on the DVD). Doyle uses effects to ‘bleach out’ parts of the background to represent the blinding glare of the sun. Low and high angles and the superimposition of different shots of the two girls creates a sense of confusion. The music during these scenes is just as important in creating an atmosphere as it is in the Moore River scenes. Again, Peter Gabriel uses ‘samples’ of natural sounds and Aboriginal musical instruments to create a synthesised score. Gabriel’s reputation as a promoter of ‘World Music’ has meant that the score has been both widely praised and also condemned as ‘inauthentic’. What do you think? Just as in the Americas, European explorers who ‘discovered’ Australia and the other islands of the South Pacific in the 17th Century encountered people who had already lived there for thousands of years. In Australia, the British were the first to build significant settlements in Eastern Australia following the voyage of James Cook in 1770. British settlement drew upon the earlier experiences of the Spanish and Portuguese in Central and South America and the Spanish, British and French in North America. These experiences were different, especially in the degree of ‘interaction’ and conflict between the invading Europeans and what were then called the ‘native peoples’ (these peoples were also given more emotionally charged names such as ‘savages’ etc.). In every case, the native populations were reduced by slaughter at the hands of settlers with better weaponry, diseases brought from Europe and malnutrition as Europeans destroyed the local food culture, often based on hunting. In North America, the British and French tended to keep a distance from native peoples, but in ‘Latin America’, the Spanish did mix more freely and intermarried more frequently. The result in many countries is a much more ‘mixed’ population today. Compare Canada and Mexico. In Canada, a country of 31 million people, nearly 1 million are classed as ‘Aboriginal’ and of these, 290,000 are classed as métis or of mixed race. In Mexico, a country of 100 million, the largest group of people (60%) are mestizos or mixed race. A further 30% are ‘Amerindian’ or ‘indigenous peoples’. Only 9% are ‘European’ or ‘White’. Australia is much more like Canada in terms of population. In 2001 Australia had 410,000 people who were classified as ‘indigenous peoples’, out of a total population of 19 million. As in Canada, Aboriginal peoples make up a much bigger proportion of the (sparse) populations of the more remote ‘outback’ areas. These are in Northern and Western Australia. Most of the Australian population that developed from immigration lives on the coasts of Southern and Eastern Australia. The Australian government department dealing with indigenous peoples was the ‘Aboriginal and Torres Straits Islander Commission’ (ATSIC) up to 2005. It was replaced by The National Congress of Australia’s First Peoples (http://www.hreoc.gov.au/social_justice/repbody/index.html) in May 2010. The Torres Strait is the area between Northern Australia and Papua New Guinea. The original or native inhabitants of a country. The term itself is thus strictly descriptive. It has, however, been shortened to make a term of abuse, as in ‘abo’ and it is misleading in suggesting that there is a single group of Aboriginals. In Australia (as in Canada and the United States) there are many different aboriginal groups with different languages and cultures, each of which might describe itself as a ‘nation’. This is why these notes have referred to aboriginal peoples in the plural. Q. What difference do you think it would make if Australians adopted the American way of referring to indigenous peoples and called them ‘Native Australians’? Sexual relationships between European explorers/settlers and indigenous peoples were an inevitable part of contact between the two groups from the first landings of the Europeans. It was especially likely in Australia, where many European men in the outback were unlikely to be able to find a European woman as a partner. European settlement forced indigenous peoples into a colonial relationship. This meant that they were treated not as citizens, but more as the property or responsibility of the colonial government (i.e. in Britain or its representatives in Australia). Throughout the ‘British Empire’ which developed from the 17th century onwards, the colonial governments treated indigenous peoples as if they were ‘inferior’ to Europeans. They were referred to as ‘heathens’ or ‘savages’ and were treated as if they were children. Their education was often left to Christian missionaries. The colonialists were terrified that ‘interbreeding’ with indigenous peoples would lead to a ‘degeneration’ of white society. A whole literature and language relating to racial mixing developed which has had consequences for the status of mixed race people ever since. Mr Neville’s lecture to the women in Rabbit-Proof Fence is typical of the widespread beliefs in Britain and Australia in the 1930s. The rabbit-proof fence was a historical fact – extraordinary as it may seem. A British settler, Thomas Austin, brought 24 wild rabbits over from the UK in 1859, hoping to develop a breeding stock for food (the domestic UK rabbit was not hardy enough to survive). Some of them escaped and with few natural predators, a rabbit population explosion started. By the end of the century their numbers were in the hundreds of millions. The mad idea of fencing off part of a continent to protect the grazing land was suggested in a Royal Commission of 1901 and by 1907 the fence was in place. Whether it had any effect in keeping out the rabbits from Western Australia is debatable. Given the context outlined above, it isn’t surprising perhaps that Rabbit-Proof Fence proved a controversial film release in Australia. The film presents itself as a true story, based on the book by Dorothy Pilkington, which in turn is based upon detailed research and interviews with two of the girls who are seen as they are today in the Epilogue section. The history of what happened to mixed race Aboriginal children was finally ‘brought out into the open’ in 1997 with the publication of an Australian Government report entitled ‘Bringing Them Home’ (detailed education materials on the report and the Rabbit-Proof Fence book are available from the Australian Human Rights and Equal Opportunities Commission – see Refs). One of the problems for any filmmaker approaching a subject like that of the historical journey made by the three girls in 1931 is that the screen representation can never be an exact reconstruction of the event. Film and media studies have developed precisely to allow us to develop the critical skills with which to ‘deconstruct’ any text and expose the ways in which it has been constructed. However, this is just the first problem. When the filmmaker has decided on an appropriate means of constructing representations of the girls in the environment of Jigalong and Moore River, the next stage is to consider the shaping of the story. In order to create an entertaining feature film, some events will be left out and others perhaps manipulated to make a more dramatic story. Most audiences are aware of the need to do this, but they will trust a filmmaker that the ‘based on a true story’ tag will mean that the basis for the story and the main themes and ideas are represented as faithfully as possible. History, especially when it has been recently ‘uncovered’ or ‘re-written’ will always be controversial. Opponents of the new history (and therefore defenders of the old history) will seize upon on any minor changes to the facts of the story and turn this into a refutation of the whole set of events. Tony Hughes-Daeth (2002) in a detailed discussion of the various elements of the Rabbit-Proof Fence story, suggests that what Australia has been experiencing is something similar to the debate about the Holocaust in Nazi Germany and to the Truth and Reconciliation Process in South Africa – Australia has been debating how to create a formal process which will allow the history of the ‘Stolen Generations’ to be recorded. Hughes-Daeth argues that the film of Rabbit-Proof Fence attempts to ‘universalise’ the story, to make it available to an international audience. This he argues is achieved by concentrating on just the story of the three girls (i.e. little is said about what happens to the other inmates of Moore River) and presenting their story less through dialogue and more through the strong visuals and music. In this respect, he argues that the film ‘model’ for the approach in Rabbit-Proof Fence is Spielberg’s Schindler’s List (US 1993), another ‘based on real events’ story. The novel Schindler’s Ark was written by another Australian, Thomas Keneally and told the story of the businessman who saved Jews from the gas chambers of Auschwitz. Enjoy the film for its cinematic qualities, but always remember that this is pure fiction. The events depicted never happened. The clever little historical note at the end is nice touch to make audiences think the events depicted actually happened. The heroine of the film was *not* stolen, but – as official files reveal – removed only after fears were raised for her safety and after a nod of approval from her stepfather. The so-called ‘Stolen Generations’ is an enduring myth of the Australian scene. The facts are that despite enormous efforts not one single stolen Aborigine has been found, let alone a dozen – or generations. However, it’s a heart-rending tale that makes for good press and a good screenplay. Good film about governmental “adopting” of half-caste children in the hopes of civilizing them is worth checking out to remind oneself that you don’t have to look far to see painful truths about any country, even one as seemingly sublime as Australia. IMDB lists Rabbit-Proof Fence as having a production budget of US$6 million. Produced wholly in Australia with a significant investment of public funds, the box office gross in Australia was over US$3.75 million after a long run of some 18 weeks. This compares favourably with grosses for Hollywood films in Australia and it was the second best performance by an Australian film in its domestic market in 2002. Abroad, the film was treated much more like an art film, but in some of the largest markets the film did well; US$6.1 million in North America, £1.4 million in the UK and Euro1.3 million in Germany. www.boxofficemojo.com suggests a total worldwide box office of US$16 million. 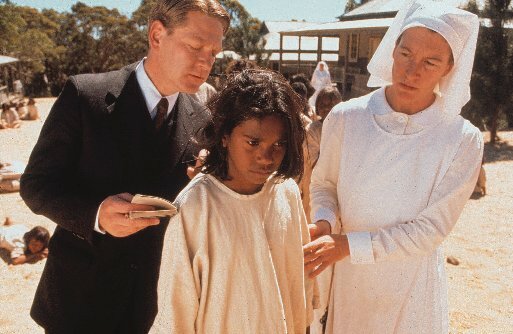 Although Rabbit-Proof Fence is ‘wholly Australian’ in terms of production finance, the creative input into the film reveals the extent to which Australian talent is an integral part of the international film industry. The producer-director of the film has an interesting background, especially in terms of the ‘political commitment’ which several commentators have detected in his approach to the events of 1931. Philip Noyce (born 1950) began as a documentary filmmaker, producing his first feature Backroads in 1977 – an ‘existential road movie’ with references to racism in the Australian outback. (It was this film that alerted writer Christine Olsen to the possibility that Noyce might be the director to approach with the Rabbit-Proof Fence script.) In 1978 he made one of the most celebrated films of the ‘Australian New Wave’ of the 1970s. Newsfront told the story of two newsreel photographers in the Australia of the 1950s, a crucial period in the postwar development of the ‘young country’, experiencing immigration and welcoming the world to the Melbourne Olympics of 1956. After two less well-received features in the 1980s, Noyce moved to Hollywood by means of an Australian/US co-production, directing another Australian emigrée, Nicole Kidman, in the thriller Dead Calm (1989). This was followed by a series of big budget thrillers, including the Tom Clancy films with Harrison Ford as Jack Ryan in Patriot Games (1992) and Clear and Present Danger (1994), which seemed to imply that Noyce had lost any political/social edge in favour of Hollywood technical proficiency. But in 2002 Noyce re-emerged with two controversial films, Rabbit-Proof Fence and an adaptation of Graham Greene’s The Quiet American with Michael Caine. This latter film was very critical of American ‘interference’ in South East Asia and Miramax found it difficult to release in the ‘post 9/11’ climate. Cinematographer Christopher Doyle (born 1952) has a very interesting background. Although Australian by birth, he went to university in the United States and travelled extensively in Asia. His film career began in Hong Kong and Taiwan and he is probably best known for his work with the Hong Kong director Wong Kar-Wai, for whom he produced very striking images of urban locations. He has also worked with the Chinese director Zhang Yimou, someone else with an international reputation for strong visual styles and on productions and with Hollywood ‘independent’, Gus Van Sant on his (visually unusual) remake of Hitchcock’s Psycho. The music for the film was composed by Peter Gabriel, the British rock musician who over the last twenty years has been associated with showcasing ‘world music’ on the international stage, through both recording artists on his own label and organising tours and festivals featuring musicians and performers from Africa and Asia in particular. The actors in the film are mostly unknown outside Australia and much focus has been on Noyce’s work with the girls selected to play the central characters. (The UK DVD release includes a documentary showing how the girls were selected through auditions across Australia.) The exceptions in the cast are Kenneth Branagh, the British ‘actor-manager/director’ who has recently turned to smaller, ‘character’, roles after a period in the early 1990s of high profile actor-director roles and David Gulpilil, who in the 1970s and 1980s played aboriginal characters in several important films, including Walkabout (UK 1971) and The Last Wave (Australia 1977), as well as the international comedy hit Crocodile Dundee (Australia 1986). These details about the creative input into the film are useful in demonstrating that although Rabbit-Proof Fence is essentially a ‘small, Australian film’, it is also the product of experienced filmmakers, well aware of how to interest international audiences. Wow, Roy, an impressive resource. Will have to watch this one – would this work as a post colonial text? That’s an interesting question. I’ve been puzzling over District 9 and whether that is a ‘post-colonial’ text – i.e. when does colonialism as such actually end? Western Australia in the 1930s would still be a predominantly ‘white settler’ community with deeply embedded colonialist ideologies from the UK. But in lots of ways, the parallel is with the American treatment of aboriginal peoples post the opening up of the West in the 19th century. I think I need to read a bit more about how film studies discusses post-colonialism. I suspect your query is related to A Level specifications? Yes, it is. The A Level spec for Communication and Culture covers post colonalism but any suggestions for potentially interesting and accessible contemporary films that could be studied as post colonial? I guess the notion that colonalism never really ends is quite true given that it is perpetual and on going. So what’s the difference between colonalism and imperialism, I always get the two mixed up?